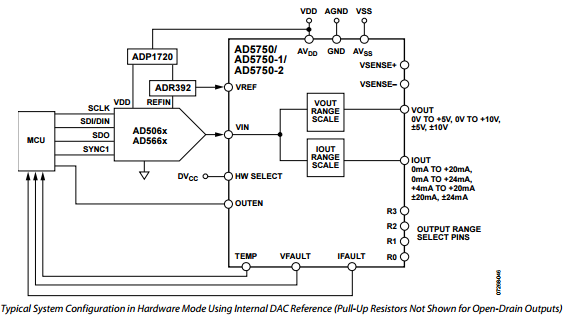 Does the DAC AD5755-1 support mA output in Sink mode? or what would be the equivalent part which supports sink mode output? Thank you very much Mark for the information. The AD5755-1 does not have current sinking capability. A discrete circuitry should be added. I don’t have a design at hand but it would likely take a large amount of area for 4 channels. You may want to look at the AD5750 for single channel option. However, please note that the AD5750 needs an analog input so you will need a quad channel DAC for four channels of your application. I would recommend the AD5064 for the input requirement of the AD5750. A sample system configuration for the AD5750 is shown below.